Recently this has been my favourite outfit so I thought I'd share it with you all! The top and pants are both from h&m, I'm loving h&m at the moment I think they have some fab pieces at the moment that are so affordable! 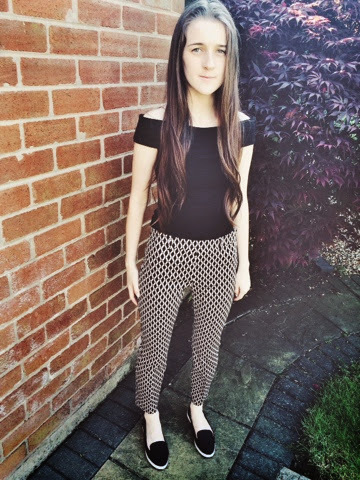 These pants were £12.99 and the top was £10 I think was a bargain! Personally I love the patterned pants trend and I already have two pairs and I'm sure I'll buy many more to add to my collection! I particularly like these because there black and white because I think you can wear them in winter with boots or in summer with sandals or shoes! I love this top as it's an off the shoulder top that's textured but you can't really see from this picture this is also very versatile! I think this would look lovely with skirts too as it's very fitted! I managed to pick up the shoes whilst Dorothy Perkins had there 25% off so I managed to get these for around £16 which I think is quite reasonable! What's your favourite trend at the moment? 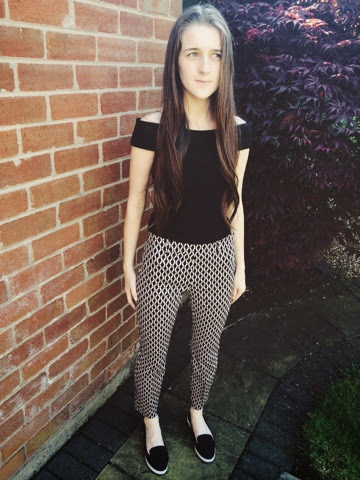 3 comments on "Patterned Trousers"
Do yo want follow each other on bloglovin? If yes just follow this page and comment on my blog, I'll follow back.